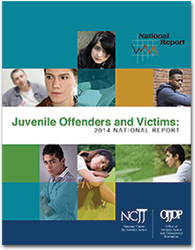 The National Center for Juvenile Justice, the research division of the National Council of Juvenile and Family Court Judges, announces the release of Juvenile Offenders and Victims: 2014 National Report, the fourth in a series of comprehensive reports, funded by the Office of Juvenile Justice and Delinquency Prevention. The 2014 National Report draws upon reliable data and relevant research to offer a clear view of juvenile victimization and offending and the justice system's response. The 2014 National Report draws upon reliable data and relevant research to offer a clear view of juvenile victimization and offending and the justice system's response. The juvenile arrest rate for Violent Crime Index offenses is at a historically low level, and the number of murders committed by juveniles is at its lowest point in at least three decades. The juvenile court delinquency caseload continues to decline, reaching its lowest level since at least 1990. However, female juveniles account for a larger share of the delinquency caseload than at any point in the last two decades. Following a decline since 1999, the juvenile residential placement population reached its lowest level in nearly two decades. Explore the age boundaries each state establishes for juvenile justice, transfer to criminal court and status offenses. Learn about juvenile defense and state efforts to address disparities in juvenile justice for youth of color. Explore differences in how juvenile courts and juvenile justice intervention services are organized and delivered. Learn about what the states are doing to share information and coordinate services to assist dual-status youth. Three case studies of states with strong support for juvenile justice evidence based programs, policies and practices. Case studies provide insights into evolution toward supporting excellence in juvenile justice in different juvenile justice environments and at different levels of development. 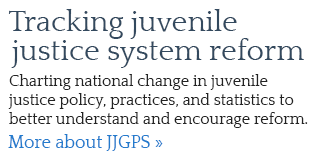 A great resource for states considering pathways toward supporting evidence-based practices in juvenile justice. Click here to view the case-study.